Every sport has its old-school heroes: the greats of a time gone by, forgotten in the shadows of ESPN and Instagram. It’s hard to even imagine Wilt Chamberlain dropping 100 points in a single game in the days before Michael Jordan; or Johnny Unitas passing for over 40,000 yards before Peyton Manning was even born. But without the history created by those early champions, our modern sports just wouldn’t be the same. You’ve probably heard of Chamberlain, and Unitas, but maybe you haven’t heard of John Grimek or Jack LaLanne. That’s a shame, because in their day, Grimek and LaLanne shocked the world with feats of fitness performed in a time before fancy training methods and performance-enhancing drugs. Grimek was a national champion in weightlifting and represented the United States at the Olympic Games held in Nazi Germany in 1936. And he had such a great body that when he took his shirt off, women literally screamed in delight. In 1955, LaLanne “escaped” from Alcatraz Island by swimming from there to the mainland. The water was ice-cold, there was a strong current, and, oh yeah — Jack was handcuffed the entire time. What was their secret? No one taught Grimek or LaLanne how to lift huge weights or swim handcuffed. Back in those days, people worried that if you exercised too hard, you’d have a heart attack, or that your muscles would grow so big that you couldn’t move. So the old-school guys (and sometimes gals, although women were even less likely to work out) had to figure their training out for themselves. 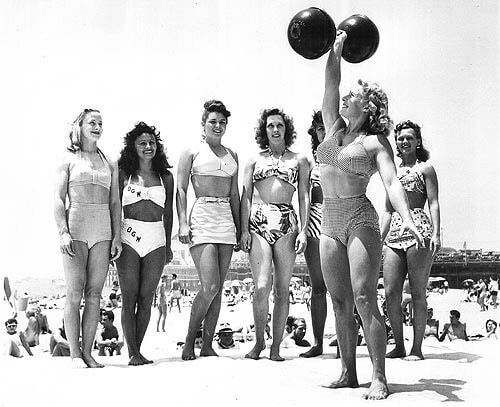 And because there were so few gyms back before World War II, a lot of that old-school training happened outdoors, and without any special equipment. Both Grimek and LaLanne regularly practiced hand balancing — basically, performing stunts like push-ups, distance walks, and timed holds all while in a handstand. All that time upside-down helped them build chiseled shoulders and arms, along with strong, tight abs, which obviously helped them in any athletic endeavor. In fact, hand balancing worked so well that lots of bodybuilders and weightlifters practiced it. Abbye “Pudgy” Stockton (one of America’s first female weightlifters), Joe Gold (founded Gold’s Gym), Steve Reeves (literally Hercules), and others like Bert Goodrich, Jimmy Payne, and George Redpath all tried hand balancing at one point in their careers. Today, scientists know that the core stability built by exercises like handstands builds strength and transfers to athletic performance. Of course, handstands alone aren’t enough — you need to build muscle with progressive resistance, too. But handstands can be a great movement to incorporate into your training, especially if you’re trying to be the most well-rounded athlete you can be. Back in Grimek’s day, that’s what bodybuilding contests were all about: the 1946 contest which awarded the title of “America’s Most Muscular Physique” included posing, Olympic weightlifting, and handbalancing. It wasn’t enough to look strong — you had to be strong, too! 1. As your main core workout. In a lot of ways, handstands are a much more demanding version of a plank, the classic static-strength ab exercise. If you already incorporate planks into your training (which you should), you can just swap them for handstands. It’s best to include strenuous core work on a day that you’re already training with weights, and after any compound barbell exercises you have planned. Because squats, deadlifts, and Olympic lifts rely on core strength for stability, you don’t want to pre-exhaust yourself before performing them, or you might risk injury. 2. As an upper-body assistance movement. Obviously, handstands are going to hit your upper body pretty hard. In fact, many of the old-time strongmen and bodybuilders were known for having fantastic deltoid development. Handstand push-ups are an incredibly challenging upper-body assistance movement, but they’re guaranteed to build boulder shoulders that are strong, too. 3. As part of a conditioning circuit. Now, I’m not a fan of hand balancing for conditioning if you’re a strength or physique athlete – I think there are better methods out there. But if you’re just training to feel good and look good, then handstand walks can be a great way to spice up your conditioning. Superset them with some type of demanding lower-body metabolic conditioning, like heavy sled drags, for an absolutely brutal circuit. As much as some people love to tout the benefits of “modern,” super-scientific programs and diets, there’s a heck of a lot to be learned from the no-nonsense, simple routines of physical culturists from the early 1900s. Hand balancing is just one example, but if old-school strength is your thing, I highly recommend you check out Iron Game History: The Journal of Physical Culture. It’s an academic publication, so some articles might be a little dense, but there’s a veritable treasure trove of information on training from strength’s Golden Age, and it’s all available for free on the web. Check it out here. In the meantime, if you’d like to know more about Jack LaLanne, John Grimek, or anything else related to strength history, drop me an email or mention it in the comments below!